These sinuses are lined with mucous membranes and minute, finger-like outgrowths called cilia, which serve as the first line of defense against airborne irritants. The membrane, which is made up of soft, pink tissue, secretes mucus, which helps filter the air we breathe by trapping dust and other respiratory allergens. Most of the sinuses empty into the nose through a small drainage channel called the middle meatus. The cilia help move the mucus along with the trapped particles into the nose and out of the sinuses for good. Whenever there is a breach in this security wall such that an irritant finds its way into the respiratory system, the smooth sinus drainage is bound to get disrupted. Respiratory infections such as the common cold as well as seasonal allergies can lead to an irritation or inflammation of the mucous membrane that lines the insides of your nose. Subsequently, the body’s natural defenses go into overdrive to flush out the culpable irritants, and this results in an increased amount of mucus secretion. The swelling of the mucosal lining makes it difficult for the sinuses to drain out the excessive mucus, leading to nasal blockage and subsequent buildup of sinus pressure. As the mucus piles up in the sinus cavity and the inflammation continues, the mounting sinus pressure can be felt around the nose and cheeks and above the eyes. Moreover, these areas of the face may feel painful or tender. You may even experience pain over your teeth. The throbbing pain associated with sinus pressure tends to be at its worst during the morning. The pain gets aggravated when you look down or bend over. Sinus pressure symptoms can be painful and uncomfortable to deal with, and it can take a toll on your daily life. While decongestants and pain relievers can help, they often come with unwanted side effects. 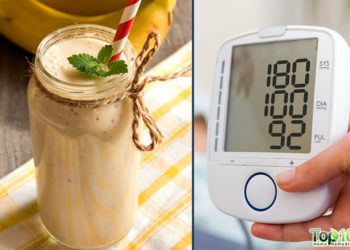 Why put your body through the extra trouble when this relatively harmless problem can easily be treated by alternative home remedies by using some commonly available ingredients and easy healing techniques. Such all-natural home remedies work particularly well to ease mild to moderate symptoms and boost your recovery in the nascent stages of the condition. Note: If you continue to experience sinus pressure symptoms after a week or if they begin to worsen, get help from a doctor as it could be a sign of a more serious infection that warrants antibiotics. Dry air and dry sinuses can increase sinus pressure and lead to a headache. Steam inhalation is considered to be extremely beneficial in keeping the sinuses moisturized. Steam helps to moisten your sinus passages and thins out mucus that may have thickened over time. A 2016 study published in the International Journal of Contemporary Medical Research reports that steam inhalation definitely improves nasal mucociliary clearance. Another 2016 study published in CMAJ reports that primary care for chronic or recurrent sinus symptoms cannot depend solely on the use of steam inhalation, but it did provide some symptomatic benefit nonetheless. You can either use plain water or infuse it with herbs or essential oils to promote sinus drainage. Fill a pan with water, heat it until it boils, and then turn the heat off. Add a few drops of peppermint or eucalyptus essential oil to the hot water. Put a towel over your head, lean over the pan, and inhale the steam for a few minutes. Repeat this technique 2–4 times a day. Alternatively, close the bathroom door, run a hot shower, and breathe in the steam vapors for 5 to 10 minutes. Do this daily for a few days until the symptoms clear. Caution: Steam inhalation is not recommended for small children, pregnant women, and those suffering from high blood pressure. Another common treatment for sinus pressure is a saline wash.
Gently flushing out your nasal passages with a sterile saline solution helps alleviate the congestion by thinning and dislodging the jammed mucus. Moreover, it increases the moisture in your nostrils, which in turn helps reduce the inflammation or pressure on your blood vessels. A 2014 study published in the Journal of Microbiology, Immunology and Infection reports that nasal irrigation is an effective adjunctive treatment for acute sinusitis in atopic children. Another 2017 study published in the International Journal of Environmental Research and Public Health adds further support to the merits of nasal irrigation as an effective treatment technique for several acute and chronic sinus conditions. Whenever you suffer from sinus pressure or nasal congestion, keeping your body optimally hydrated acquires even greater importance. Proper hydration helps keep the mucous membranes in the sinuses adequately lubricated, thus helping dislodge the mucus more readily. On the other hand, insufficient fluid intake can cause dehydration and ultimately lead to thickening of the mucus, which then becomes too consolidated for proper drainage. A review article published in the Canadian Family Physician upholds the textbook recommendations of maintaining adequate hydration in order to loosen mucus secretions, which is imperative for tackling symptoms of acute sinusitis. While water is the best choice to remain hydrated, you can also retain fluids through other foods and beverages such as broth, soups, herbal tea, and water-based vegetables and fruits. At the same time, it’s just as important to cut back on alcohol and caffeine as both are renowned diuretics that contribute to dehydration. Alcoholic and caffeine consumption near bedtime is particularly detrimental and can exacerbate your sinus strain greatly. Cayenne pepper is another good remedy to relieve sinus pressure. Being a natural decongestant, it helps loosen mucus and promote sinus drainage. The natural chemical capsaicin in cayenne pepper helps relieve the swelling and inflammation that is narrowing your nasal passages. A study published in Annals of Allergy, Asthma & Immunology reports that a nasal spray containing an ingredient derived from hot chili peppers may help people “clear up” certain types of sinus inflammation. Add ¼ teaspoon of cayenne pepper powder to 1 cup of boiling water. Sip a cup of this tea a few times a day. Another option is to use a nasal spray containing cayenne pepper; this is readily available over the counter at pharmacies. Use it as directed. Eucalyptus oil can help relieve sinus congestion. Possessing strong anti-inflammatory and decongestant properties, this natural tonic may be what you need to get rid of sinus pressure. Eucalyptus oil has emerged as an effective and safe treatment for sinusitis, mainly due to one key component: 1,8-cineole. Add a few drops of eucalyptus essential oil to hot water and inhale the steam. Repeat the process a few times until you get complete relief. Also, dilute a few drops of eucalyptus oil with some carrier oil such as almond or jojoba oil. Rub this gently on the affected areas – around the nose, forehead, temples, and cheeks. Applying heat to the sinus area can also help to relieve pressure. One of the easiest ways to do this is by using a warm washcloth. Soak a towel in a bowl of hot water. Squeeze the excess water out of the towel. Fold it and place it over your nose and forehead. Do this for 3 to 5 minutes. Repeat as often as necessary until all the mucus has cleared. You can also pace warm, damp towels around your nose, cheeks, and eyes to ease facial pain. To aid sinus drainage and reduce sinus pressure, massaging the nostrils is a simple yet highly effective remedy. Massage improves circulation to the area, helping thin out the mucus and facilitating its movement out of the sinuses. 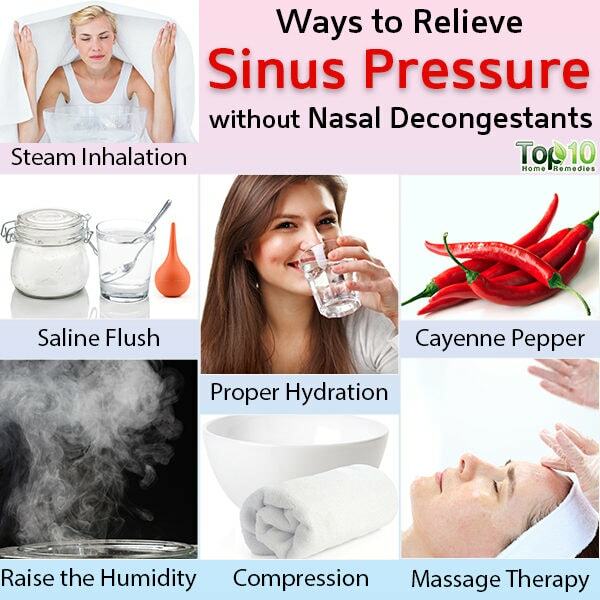 This is perhaps one of the most hassle-free ways of getting quick relief from sinus pressure. Warm up some olive oil and add a few drops of peppermint oil to it. Sit in a semireclining position and apply the oil on your nose. When performing this massage, make sure to breathe through your mouth and not through your nose. Increasing the humidity in your home or the room in which you sleep can aid in sinus drainage and thus help in reducing sinus pressure. The sinuses need a moist, warm environment to function properly. Moist air can soothe irritated tissues and swollen blood vessels in your nose and sinuses. On the other hand, lack of moisture in the air can irritate the sinus cavity further, causing more congestion. The American Academy of Otolaryngology – Head and Neck Surgery recommends keeping your breathing environment adequately moist to prevent drying out your sinuses. Hence, it is recommended to run a humidifier and maintain a humidity level of 45 percent to 50 percent. Instead of a commercial humidifier, placing a bowl of hot water on your bedroom floor can increase the moisture in the air. Be sure to place it in a safe place where you won’t accidentally tip it over or step into it. Irrespective of what you prefer to use, keep your humidifier clean to prevent the growth of bacteria and mold. Sleeping peacefully can be quite challenging when you feel like your head is going to explode due to mounting sinus pressure. However, getting enough rest and shut-eye is extremely important for timely healing. A good night’s sleep can help the body to heal as, when you’re at rest, your body is able to produce more white blood cells essential for combating the viruses and other bacteria that may be at the root of your respiratory discomfort. However, for sleep to be effective in alleviating sinus symptoms, you must do it right. Certain sleeping positions can end up adding to your discomfort and are to be avoided. These include lying flat on your bed as it can increase mucus buildup in your nasal passages and augment sinus pressure. You may be jolted out of sleep due to hampered breathing on account of the congestion, which can considerably disrupt your sleep cycle. Instead, prop a few pillows under your head to keep it raised above your heart. This will help prevent sinus buildup and can help you to breathe more comfortably. To enjoy better sleep, refrain from indulging in overstimulating activities or consuming sugary or caffeinated beverages too close to bedtime. Practice deep breathing and meditation to achieve relaxation and reduce sinus pressure. Physical activity can increase blood circulation and temporarily relieve congestion to ease breathing. Avoid chlorinated pools as it can irritate your nasal passages. Acupressure, a key part of traditional Chinese medicine, may also ease symptoms. If allergies are to blame for your sinus pressure, consider taking an antihistamine before bed. Blow your nose to reduce mucus before bed, but avoid aggressive blowing as it can increase irritation and move harmful bacteria into your sinuses. Gujrathi AB, Ambulgekar V, Handal A. Effect of Steam Inhalation on Nasal Mucociliary Clearance in Normal Individuals and Nasal Disease Sta. Scribd. https://www.scribd.com/document/322558148/Effect-of-Steam-Inhalation-on-Nasal-Mucociliary-Clearance-in-Normal-Individuals-and-Nasal-Disease-Sta. Little P, Stuart B, Mullee M. Effectiveness of steam inhalation and nasal irrigation for chronic or recurrent sinus symptoms in primary care: a pragmatic randomized controlled trial. CMAJ : Canadian Medical Association Journal. https://www.ncbi.nlm.nih.gov/pmc/articles/PMC5026511/. Published September 20, 2016. Wang Y- H, Ku M- S, Sun H-L. Efficacy of nasal irrigation in the treatment of acute sinusitis in atopic children. Journal of Microbiology, Immunology and Infection. https://www.sciencedirect.com/science/article/pii/S168411821200179X. Published September 30, 2012. Principi N, Esposito S. Nasal Irrigation: An Imprecisely Defined Medical Procedure. International Journal of Environmental Research and Public Health. https://www.ncbi.nlm.nih.gov/pmc/articles/PMC5451967/. Published May 11, 2017. Worrall G. Acute sinusitis. Canadian Family Physician. https://www.ncbi.nlm.nih.gov/pmc/articles/PMC3093592/. Published May 2011. Bernstein JA, Davis BP, Picard JK. A randomized, double-blind, parallel trial comparing capsaicin nasal spray with placebo in subjects with a significant component of nonallergic rhinitis. Plum X Metrix. https://www.annallergy.org/article/S1081-1206(11)00383-8/fulltext. Published August 2011. Kehrl W, Sonnemann U, Dethlefsen U. Therapy for Acute Nonpurulent Rhinosinusitis With Cineole: Results of a Double‐Blind, Randomized, Placebo‐Controlled Trial. Wiley. https://onlinelibrary.wiley.com/action/showCitFormats?doi=10.1097/00005537-200404000-00027. Published January 3, 2009. Hendry ER, Conway BR, Lambert PA. Antimicrobial efficacy of eucalyptus oil and 1,8-cineole alone and in combination with chlorhexidine digluconate against microorganisms grown in planktonic and biofilm cultures. Journal of Antimicrobial Chemotherapy . https://academic.oup.com/jac/article/64/6/1219/743860. Published October 16, 2009. Harvard Health. https://www.health.harvard.edu/newsletter_article/sinusitis. Published December 2008. Kecskes AA. Lymphatic Drainage and Facial Massage can Help Sinus Infections and Allergies. Pacific College. https://www.pacificcollege.edu/news/blog/2014/10/12/lymphatic-drainage-and-facial-massage-can-help-sinus-infections-and-allergies. Published December 18, 2017. Very helpful article! Already shared to my colleague who used to have sinusitis. Thanks for these tips!